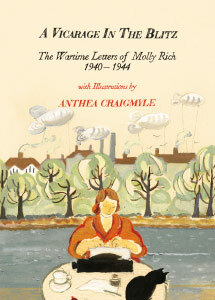 Anthea Craigmyle’s childhood years were spent in the rambling old vicarage overlooking the Thames on Chiswick Mall, London. Growing up in a large family, she and her brother and sisters spent their time exploring the river, old warehouses, graveyards, and Chiswick Park. With the onset of WWII, Anthea was shuttled between London and the country in an effort to protect her from the bombings, many of which she experienced whilst sleeping in the vicarage cellar amongst young Jewish refugees and neighbours. During her school years, Anthea had the good fortune to be taught by two remarkable teachers: first, Mrs. Henry Moore and then later, Kathleen Richardson. It was Kathleen Richardson who nurtured Anthea’s growing capacity for visual description from imagination. Kathleen would enter the art classroom and would describe a scene spotted on her journey from Oxford. “Paint that!” she would announce to the class as she popped a few inspirational Cezanne or Giotto postcards around the room. This was the beginning of the powerful, pictorial story-telling essence so vivid in some of Anthea’s paintings. When she went to the Chelsea School of Art, at age 17, Anthea was taught by Ceri Richards, Julian Trevelyan, and others. At 21, Anthea travelled to India where she met and later married her husband and had a large family. During this period, she was always fortunate enough to have a space of her own in which to paint. Painting has always been an essential element of her daily life. The imagery of much of her painting throughout the 50’s and 60’s was drawn from childhood memories; neglected churchyards, gardens, and parks she associated with her experiences of WWII. A Vicarage in the Blitz – now available on Amazon. Click here to see original illustrations from the book. She then made a volte face, lightening her palette and making a conscious effort to paint her immediate surroundings. Her wide range of imagery and style is unified by the frequent restatement of the interdependence within nature – people, boats, and the underlying topography of her landscapes. During the 70’s, she not only painted landscapes, but also worked with the figure and still-life. She exhibited, in London, at the Klytie Jessop Gallery in 1972. During the 80’s and 90’s, her painting became a synthesis of the real and imagined, the experienced and directly observed. She has exhibited also at Sally Hunter’s, at the Russell Gallery, at Thompson’s of Marylebone, as well as at mixed exhibitions and one-man shows at the New Grafton Gallery. Recently, Anthea has returned to the Chiswick Mall where she paints in a studio not far from her childhood home. She frequently visits and paints the West Highlands. She also seeks inspiration from the Thames, animals, boats, London gardens, as well as interior spaces. The clean, romantic quality of her work is evocative both, immediately for what they show the eye, and more subtly in a dream-like, mystical way for what lies beyond. Anthea says, “I see everything in pictures. The muddle or chaos of war and indeed of war-lives means, I think, that I’m always trying to create order.” This gives her paintings the quality of a glance – sometimes amused – into a secure and, perhaps idealised, vision of the world. Her work is a powerful reminder that the spirit and essence of life never really changes.